I took the photo below of Robert Caldwell at Corvair College #40 in Texas. It was a beautiful sunny day at Mineola-Wisener airport. Robert brought his magnificent Corvair-Pietenpol out and parked it in a shady spot, and it was quickly surrounded by admiring builders, most of whom had never seen it before, nor met Robert before. In spite of the obvious quality of the work and the praise and attention it earned, Robert was still pretty quiet about the plane and gave modest answers to builders questions. He was that kind of guy. I had to lean on him a bit to even get him to stand in the picture with his bird. If you never had a chance to meet him, you can still get a good take on how relaxed he was by looking at his pose in the picture. What few people present that day knew was Robert had just gotten out of the hospital, where he had gotten a grim cancer diagnosis. Nothing about his demeanor that day even hinted at this. It was sunny, we were at a great airport, and friendly people were on hand. It said a lot about Robert that he was there to enjoy the day, no matter what news he had received. Robert and his wife Barbara came to Corvair College #21 in Barnwell SC, and this is where his Corvair was fired up for the first time. It put a big smile on his face, but it was Barbara who let the cat out of the bag and told everyone it was also Robert’s 70th birthday. There was a big hug in the prop blast that was a very popular picture. They had a number of years of good times with the plane, but in the summer of 2017, Barbara lost her own health battle and passed away. It was a heavy blow, but one Robert took mostly to himself. When I saw him in Texas, he only spoke of it briefly, and only after no one else was present. He was neither pained nor private about it when he spoke, he just gave the feeling that some things are better spoken of in smaller settings. A few weeks after the College, Robert made the decision that quality of his time was more important than the quantity. One of the things that was important to him was getting a bit more flying in. On his last flight, he asked Kevin Purtee to fly as his wingman in his own Pietenpol. When speaking of this later, Kevin said of the many things he has done in flight, this was among the most moving. After they landed, Robert put the plane he made, away for the last time. He was done, he had finished on his own terms. After Robert was gone, Kevin and I spoke on the phone, and we kept coming back to the point that he was simply a good man, and its a compliment that was said about Robert without reservation. If you never had a chance to meet him, at least take this away from the mans life: If you play it all the way through on your own terms, and when its done you are simply spoken of as “A Good Man”, then the days of your life were well spent. Blue Skies and Tailwinds Robert and Barbara. Our Neighbor Paul Salter has a 3,000cc Corvair Powered Panther. The engine on it is actually the one from Dan Weseman’s Prototype Panther. It has the first SPA-Made in USA Billet crank in it. Just about the time Paul was finishing his airframe, Dan was getting his 3.3Liter Billet crank stroker engine going. Because the three of us take risk management seriously, an intelligent plan was formed where the proven engine with several hundred hours on it would move to Pauls new airframe, and the new 3.3 Liter engine would be tested on Dan’s proven airframe. Common sense tells you this is a better plan than New engine/new airframe. Because we are all friends at the same airport, moving the motors around was not a big issue. In 2012, when Dan was very busy finishing the Panther Prototype, many friends showed up to play any small role that would let Dan focus more energy and hours on his then-new design. My part was I offered to assemble and test run Dan’s Corvair engine. 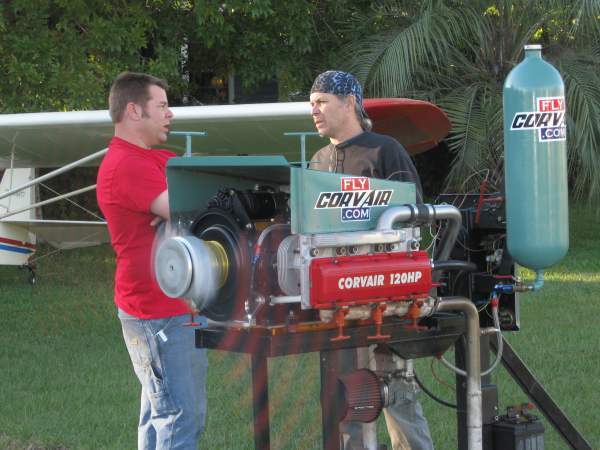 Above, Dan Weseman and I test run his 3,000 cc Panther engine in my front yard in 2012. About a month ago, Paul decided to inspect the 3,000cc engine and remove some of the non standard test items off the engine (like a special oil pan with an inspection window for monitoring cam gears) and to remove some lead build up from the combustion chambers. The engine had been on his plane about two years, so it has five birthdays. No big deal, it was some gaskets and a weekend of casual work. Above, Paul is holding the top cover. The lettering was inside the engine since I closed it in 2012. No one else had seen this, and honestly I had forgotten all about it. Above, a close up look. The handwriting is mine. If you would like to lean more about the SPA billet corvair cranks you can check out their products page or give them a call at 904-626-7777.
put this page in your favorites list, as I will be updating it with links to individual stories on each event over the next two months. When friends ask about colleges in 2018, just send a link to this story. This will be the one stop reference point to a year which will be full of events for Corvair Builders. Click on any blue link to get to the individual story of an event. For further questions, please tap into our extensive information network, this story covers more than a dozen outlets for accurate Corvair information which we work with: Outlook 2016 – The Corvair ‘Information Network’ now in gear..
Saturday Corvair Club: Here is a link to this new concept; Saturday Corvair Club. In the 12 hours after the story first were up, we hand a half dozen inquires about the availability of cores and possible scheduling. If required, I will open a “B” section to make the experience available to more builders. Finishing Schools #3 and #4 in Florida: If you have not learned about the finishing schools we have held at the SPA factory, get a look at this story: Corvair Finishing School #1, Video report. These are primarily aimed at “Engine in a Box” builders, but we have also finished and run a number of well-prepped traditional builds at these events. We have no hard dates at this point, but these events can be rapidly planned and scheduled because they don’t involve us traveling nor the infrastructure of a typical college. If you are interested in EIB engine kits or getting into the next finishing school, call SPA and speak with Rachel 904 626 7777. If you would like to see a sample success story read this: Waiex engine, 3,000 cc / 120HP Corvair of Gordon Turner. 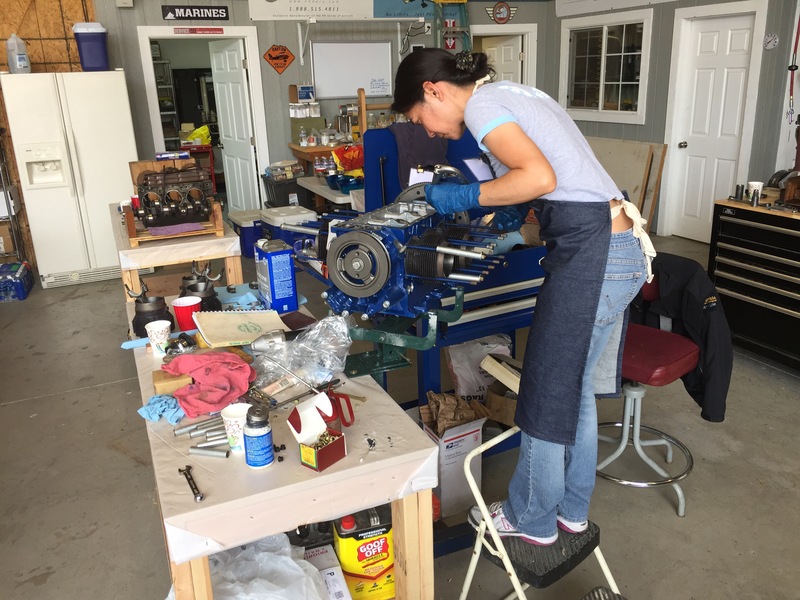 Corvair Engine building isn’t just for boys. Above, at CC#37, the very petite Kiku Williams hard at work on her 2,700 cc Corvair. Most of our stands and fixtures work for people between 5’6″ and 6’6″. No problem, Kiku just pulled up a step ladder and went to work assembling the bottom end in her hello kitty shirt. “Motorhead” is a title earned on what you have learned and built, it isn’t an appearance nor image. Would you like to trade benjamins, plastic or lead? Above, Larry Nelson’s engine on the bench at Corvair College #34. 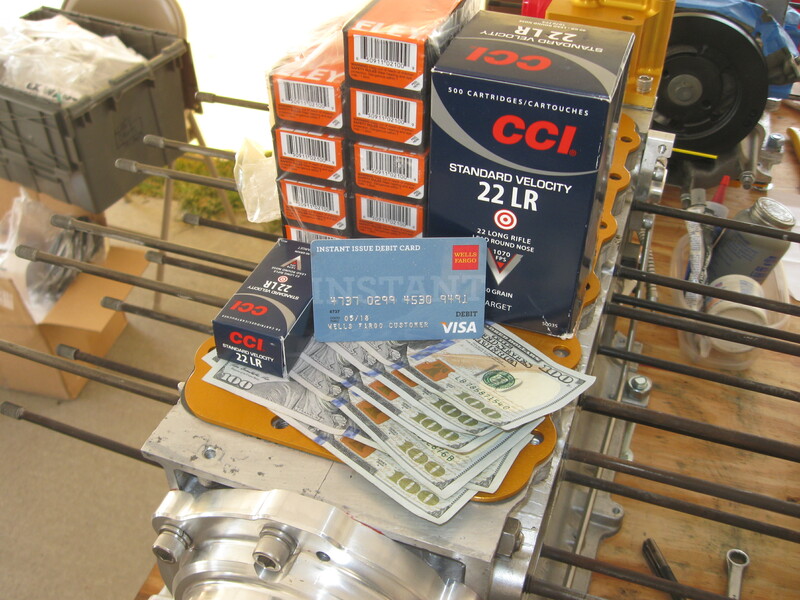 Read the story here: Acceptable methods of payment for Corvair parts. Corvair College 42 the “Southwest College” Right now we are targeting May for an event. We are looking at two different venues, Yuma AZ vs Chino CA. The first is Larry Nelson’s place, the second is Steve Glovers, where we had CC#37. There are pros and cons to each, and I’m looking for builder input for the next 45 days as we decide. Both Larry and Steve are excellent marksmen and avid shooters, and it occurred to me that we should just have the two of them meet at a target range half way between Yuma and Chino, and settle the venue question in a manner that I would find fair and interesting, with the side benefit of horrifying the politically correct Rotax 912 crowd. We will keep you posted on how this develops. Above, Randy Bush of TN stands beside his 3,000cc Cleanex at Oshkosh 2017. It was parked in the Corvair power row directly behind my booth in the North Aircraft display area. Corvairs at Oshkosh 2018, Every year for the last decade, my booth at Oshkosh has been #616 in the north aircraft display area, right across from Zenith. 2018 will be at the same spot (You rent them a year in advance). We always have a row of parking for Corvair powered planes right behind the tent. Our place and the SPA/Panther booth right next door are an Oasis of traditional homebuilding camaraderie and a gathering point for builders both during the show and after hours. We will also be holding a drawing for a core engine just like last year; Oshkosh 2017 core engine winner. Above, A 2014 picture of the five Corvair powered Zeniths that flew into Corvair College #30, all parked for a photo in front of the Zenith Factory. We have had 15 years of cooperative and productive relations with Zenith, all for the benefit of builders. Corvair College 43 The Zenith ‘Invitational” college. 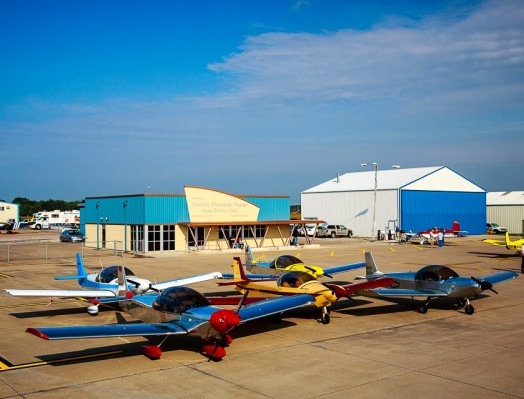 This event will be held in September in Mexico MO, during the 26th annual Zenith open house. We have previously held 4 colleges at Zenith. Here is what is different: Everyone is welcome to observe, but due to space limitations, the actual wrenching on engines will be limited to 16 builders who will want to ‘approve’ long before the event. We are selecting the builders based on the degree of prep work they are willing to do and the fact we want each engine to be a good example of how we build them and how they run. If you think you would like to be one of the 16, Contact us at SPA so we can talk about it 904 626 7777. More info on this college as it develops. Texas Fly-in: Shelley and Kevin, who have hosted 5 Texas Colleges, are getting a break this year from the great logistical volunteer effort they put into all of their Colleges. In recent years we have tried to alternate years holding a College in TX and at the Zenith Factory. They are 600 miles apart, but either location serves all regional builders. In place of a TX College, we are looking at having a Corvair Fly in at their location in Tyler Texas in September. More news as this develops. Corvair College 44, Barnwell for the tenth event there. Barnwell is our flagship College, always held in Barnwell SC on Nov. 11th weekend, which this year will be the 100th anniversary of the end of WWI. This will be a large, Full service College with space for 90 builders. We will open the registration up very early this year to allow builders to make a long range plan for progress. House Call Bearhawk LSA; range: 6,250 miles. Corvair House Call, Range: 335 miles. Read the stories above, and make plans today. As I write this, the year is almost 1/20 gone. It you want to make it count for you, you must have a plan to get the most out of 2018 and not let it drift past. Be determined, take action. While technically it is several 1964-69 complete Corvair engine cores and about 10 cylinder heads, in reality it is the raw material with half a dozen real traditional homebuilders will use, not just to provide themselves with an outstanding American made aircraft engine, but it also to transform themselves from what ever understanding they have of flight engines today, to a much higher (and therefore safer) level of understand later this year. The exact same material people without imagination locked in consumerism see as dirty metal is the same material builders will use to greatly expand their understanding, craftsmanship, skills and pride. Its your life, take your pick who you wish to spend it surrounded by. Would you like to advance your own understanding this year? The Weseman’s and myself are hosting the “Saturday Corvair Club”. One Saturday, every other moth or so, we will advance the progress of a half dozen builders a large increment. First Saturday, we will break down core engines and examine them closely. Don’t have a core engine yet? No problem, that is why I went out and picked up the ones in the picture above, they are available. After breaking them down and evaluating the parts, we will meet again in 8 weeks to reassemble bottom ends with the cranks having been reconditioned by SPA (or any engine can be assembled around an SPA Billet crank) and builders can have studied the assemble in our manuals or DVDs. They can come well prepared to learn. We will continue the process on 8 week intervals to allow builders working on a budget to stay with the program, but also to allow these builders to fully study each step so none of their learning is rushed. Our goal is to get each builder’s engine up and running on the test stand before Oshkosh this year. If an individual needs a bit longer, we can adjust and we will be glad to run their engine at a fall college. This is just another way we adjust our engine program to meet the situations of individual builders rather than typical engine companies which just sell engines one way and offer little or no training nor hands on opportunity to learn. interested in getting in on the Saturday Corvair Club? Need a Corvair motor core? Contact Rachel at SPA, 904 626 7777, and she will get you started. We will be happy to have you, and you will have made the decision that 2018 will be your year of progress in aviation. So you like the idea of auto gas…. Perhaps the second most common question I get about Corvair engines is: “Can I run one on car gas? ” The answer is yes, but like all engines that can, it comes with some limitations. The engine itself isn’t bothered by car gas, even gas with 10-15% ethanol in it. As long as the fuel has sufficient octane and is kept fresh, the motor will not have an issue. However, as I have pointed out countless times in the last 15 years, your whole fuel system, from the gas cap to the tip of the exhaust pipe, must be tolerant of the additives and ethanol they put in auto gas these days. This isn’t an imaginary issue, get a look at the pictures below. Above, a fuel petcock and screen from a 2001 motorcycle I own. you can’t see it in the picture, but the screen is so clogged that it flowed zero fuel. This is the result of leaving 93 octane car gas in it for 6 months. I usually try to run small engines, boats and motorcycles I own on what is referred to in Florida as “Marine gas” which is lead, additive and ethanol free, and about 90 octane. It can be stored a long time, and it doesn’t attack parts like carbs, fuel lines and primers. It is slightly low on octane for Corvair flight engine with compression ratios of 8.4 :1 or higher. For those engines 93 octane is the requirement. It is a very clean burning fuel in comparison to 100LL. Contrary to popular myth, lead is not good for valves, and the byproducts of combustion of leaded fuel are highly corrosive in the presence of humidity. Corvairs were designed in an era of leaded auto gas, and consequently have specifically designed exhaust valve rotators available. Lycomings use the same system to protect their exhaust valves. They are very cheap because they are the same part as a small block chevy V-8. We use these on every Corvair, and because we also use very high quality exhaust valves, Corvairs can run 100LL fuel with a minimum of valve issues. No modern car engine comes from the factory with a valve train designed to run on 100LL, but our years of working with Corvairs and the fact that we overhaul and modify every Corvair head and valves allows them to be optimized for the aviation environment. Corvairs can effectively use both 100LL and auto fuel, but it does take builders doing their part and making sure their complete fuel system is compatible with the fuels they intend to use. When salesmen are pushing engines, or people are writing magazine articles, this is often glibly glossed over, but to be the master of your own aircraft, you have to put in a little more understanding than that. Fortunately my whole Corvair program is based on the idea of builders learning things, not just buying them. Above, the screen broke to bits at the slightest touch. It could have easily done this in the tank. Before using auto fuel with additives, a builder has to seriously consider every single piece of his fuel system and evaluate if it is ready for prolonged exposure to the things they put in gasoline these days. This can be done, but it means using things like fuel lines intended for exposure to harsh additives. By comparison to automotive gasolines, 100LL is a very mild substance. My personal preference for a Corvair flight fuel is lead free, ethanol free fuel without the additives that make it go stale in 6 weeks like most auto fuel has. For a Corvair with typical compression ratio, this fuel needs to be 93 octane for reliable full performance. I intentionally built my own 3,000cc Corvair with lower compression to allow it to use lower octane boat gas. There are many good strategies available to custom tune your Corvair build to a wide variety of fuels, and our builders have long taken advantage of this to intelligently utilize the fuel of their choice. Please note this is a very different from the dope who just pumps 87 octane fuel in his aircraft tank because its “cheap.” 30 years ago you couldn’t have convinced me there were such people in aviation, today when I trying to be optimistic I try to believe they are not the majority. Either way, you are in charge of your own life, and you have the option of not being one of that herd.